This past week I attended the 111th annual conference of the American Anthropological Association (held this year in San Francisco) with my wife, Alma Gottlieb. 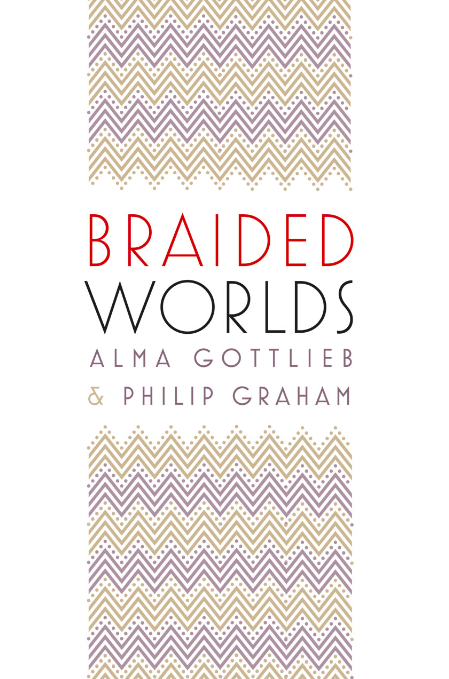 While there, we read from our co-authored memoir of Africa, Braided Worlds, as part of a “Presidential Panel” (fancy!) titled “Anthropology and Literary Engagements: Crossing Borders of Academic and Creative Writing.” The following day Alma and I had a good time teaching a creative writing workshop centered on ethnographic writing. A busy few days, but still we managed an absolutely necessary visit to the City Lights bookstore, and then to the nearby Beat Museum, so well-worn and welcoming. I’m just returned from Hong Kong, where I gave a reading from Braided Worlds, offered a presentation on Ninth Letter, and taught a three-day generative writing class at the City University of Hong Kong’s MFA program. It’s a relatively new program, but already going strong, with a wonderfully diverse and talented group of students and a fine faculty: Xu Xi, Suzanne Paola, James Scudamore and Evan Fallenberg. 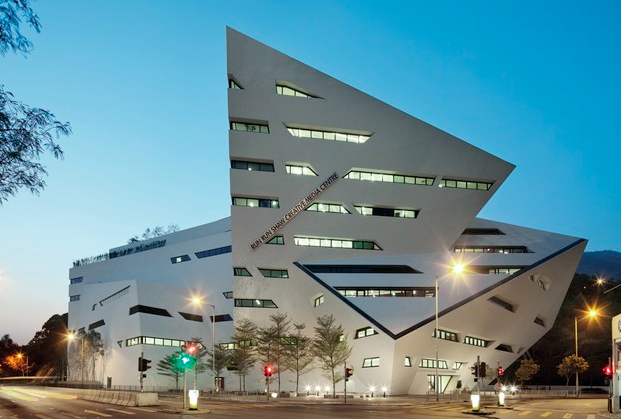 The program is housed in the trippy Run Run Shaw Creative Media Center building, which looks like it might explode from its own energy. The poet Kwame Dawes was the distinguished guest for the mini-residency, and he delivered an extraordinary lecture and reading. All the readings by the faculty were memorable, as were the student presentations. 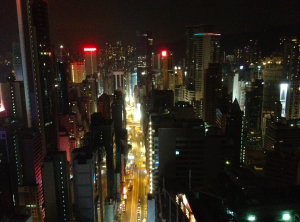 I’ve rarely been so impressed by a program, and the evenings were to die for too, especially the time a group of us parked ourselves at a rooftop bar overlooking Hong Kong island’s stunning urban landscape! 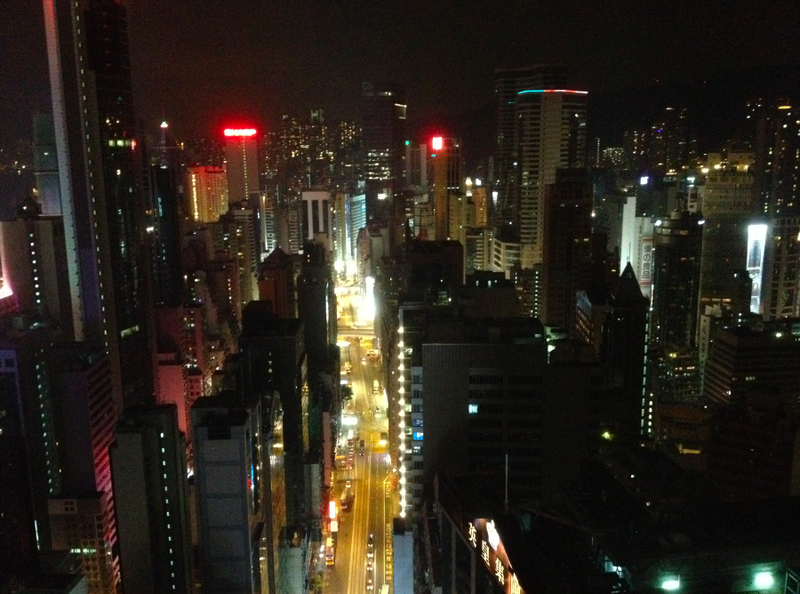 Xu Xi, the director of the Hong Kong MFA program, offers at her Ploughshares blog a run-down of the mini-residency, and she also writes an appreciative description of Braided Worlds; you can read it all here. Recently I spoke by phone with Chad Post and Kaija Straumanis of Open Letter for the Three Percent podcast series. We talked about some of our more unusual experiences at the Disquiet Literary Conference in Lisbon this summer; my collection of dispatches from Lisbon, The Moon, Come to Earth; the work of Gonçalo M. Tavares (whose series of fictions, The Neighborhood, will soon be published); Fernando Pessoa; Rui Zink; Portuguese literature in general; and we even managed to share our paeans to the French writer Antoine Volodine. You can hear us chatting away happily here. 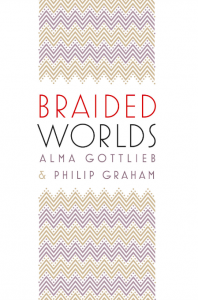 Braided Worlds (University of Chicago Press, 2012) has crossed the finish line to its official publication date, and is now available at all fine bookstores and at Amazon, and is also downloadable on the Kindle and the Nook. This is the second volume of a memoir of Africa that I’ve co-written with my wife–and inspirational life partner–the anthropologist Alma Gottlieb (the first volume, Parallel Worlds, was the winner of the Victor Turner Prize), and it arrives with a snappy cover and generous advance comments from Robert Olen Butler, Ruth Behar, and many others. 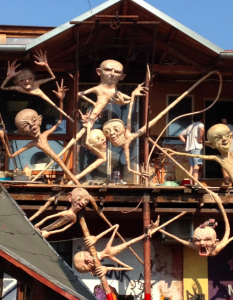 Excerpts from Braided Worlds have recently appeared on the web: “The Adventures of Tintin,” and “My Father’s African Afterlife” at McSweeney’s Internet Tendency, “The Madman and the Seismograph,” at Numéro Cinq, and “The African Food Fairy” at Leite’s Culinaria. All the royalties for Braided Worlds will be donated to the Beng people. 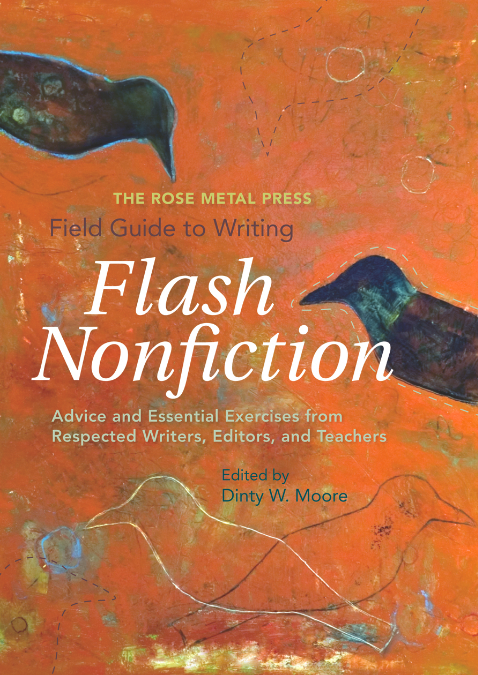 The Rose Metal Press Field Guide to Writing Flash Nonfiction, edited by the estimable Dinty M. Moore, has just been published. I’m so pleased and honored that my essay “The Ant in the Water Droplet,” is a part of this anthology, which is filled with marvelous writers I admire, including Jenny Boully, Rigoberto González, Robin Hemley, Kyle Minor, Sue William Silverman, and so many more. On Friday, September 28th, I’ll be part of a group reading from the anthology with fellow contributors Barrie Jean Borich, Jenny Boully, and Sue William Silverman, at The Book Cellar in Chicago (4736-38 North Lincoln Avenue). The reading starts at 7 PM, and is free and open to the public. More terrific news from my former students! Of my University of Illinois students, Jake Aurelian, who studied with me as an undergraduate, has published his first story collection, Dead Wrestlers, Broken Necks, & the Women Who Screwed Me Over, which has won a Finalist Award for short fiction at the 2012 Next Generation Indie Book Awards. You can read an interview with Jake, “Honest Words and Gritty Pictures,” here, in Buzz magazine. My former Illinois MFA Advisees Rosalie Morales Kearns and Amy Sayre-Roberts are doing quite well too. Rosalie’s first collection, Virgins and Tricksters, will be published this September; the publisher’s page for her book is here. And Amy’s short story, “Feast,” appears in the anthology Luso-American Literature: Writings by Portuguese-Speaking Authors in North America. 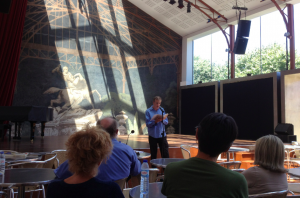 My many thanks to Professor Bruce Holsinger (of the University of Virginia) for teaching The Moon, Come to Earth as part of his travel writing course for the summer session of the Semester at Sea program (And what a program! The campus is a seven deck, 590-foot ship, which this summer traveled throughout the Mediterranean). 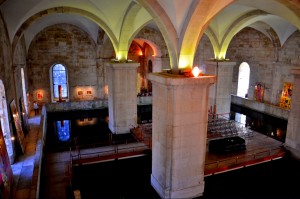 I was especially pleased to learn that the class, when they arrived in Portugal, took a tour (as one of the program’s “field labs”) of the sites described in my chapter “Three Churches.” You can see the description here. The poet Millicent Accardi has kindly interviewed me about my experiences teaching in the Dzanc Disquiet literary conference in Lisbon this summer; my books The Moon, Come to Earth and the new Braided Worlds; and much more in Portuguese American Journal, which you can access here. 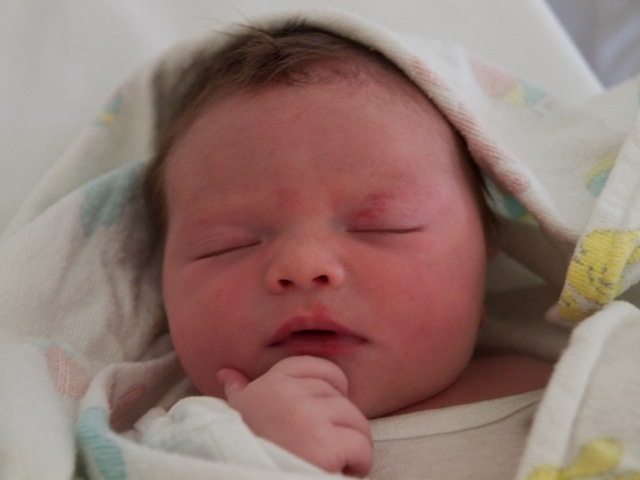 It has been a busy and rewarding year so far, but no entry in this “News & Updates” page is more important than the announcement of the birth of Dean Philip Graham, our first grandchild, on July 20, 2012. This handsome young fellow and his two proud parents, Nathaniel and Emily, are doing just fine. Immediately after teaching in the Vermont College residency abroad in Slovenia (see below), I flew from the nearby Venice airport directly to Lisbon, where I’d be a faculty member of the Dzanc International Literary Conference. Heady company, too: George Saunders, Deb Olin Unferth, the poets Christine Hume and Terri Witek, and Frank Gaspar, Robert Olmstead, Kim Addonizio, Josip Novakovich and of course Jeff Parker, calm-exuding conference organizer and eerily fine short story writer and novelist. 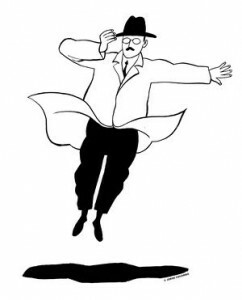 but a professional necessity: the following morning I’d be leading the program’s Fernando Pessoa Walk through a good slice of downtown Lisbon, and I needed to check my planned route. A few hours later, adjustments made, I then joined the Dzanc program’s jaunt to the Alfama neighborhood, for a night of fado club hopping. After a reviving stretch of thrilling music, I left early for some much-needed sleep, but once in bed I obsessively went over the route and what I’d say until I’m sure some of it entered my belated dreams. 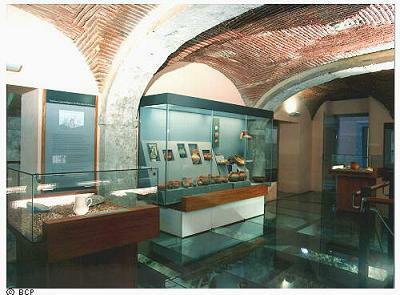 My Walk included some surprises, including a brief tour of a bank that had been built over a buried Roman ruin; the site’s recently discovered remains could be seen through the glass-paned floor of the lobby. We also stopped at the Chapelaria Azevedo Rua, where Pessoa used to buy his signature hats, an open bar where the cherry liquor ginjinha is sold by the shot glass, the scary statue of the semi-mythological creature Adamastor at the lovely Miradouro de Santa Caterina (among many other places of interest), and through it all I tried to weave some sense of what might have made one of the 20th century’s greatest writers tick. For the remainder of the conference, I led a traveling class on travel writing (for our first two sessions we convened over lunch during excursions to Cascais and Sinta), a class brimming with talented writers. One of the students, Julia Lichtblau, has already published a piece she wrote for the class, “Unconventional Indicators,” in The Common, and another student, Rosemary Nixon, received an acceptance for a story collection on the last day of the conference. 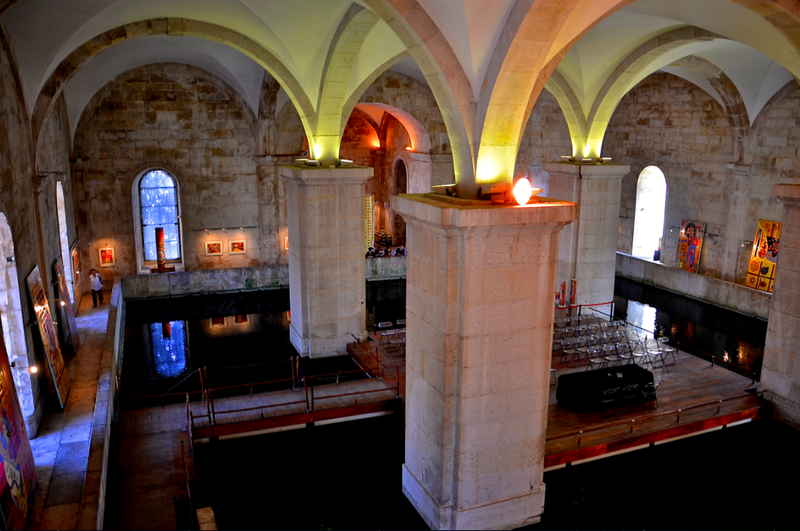 Finally, just before the conference’s farewell reception, I gave my own reading, at Mãe d’Agua, a centuries-old reservoir that features in its center a floating stage—without a doubt the most beautiful space where I’ve ever given a reading (and this photo by Glynn Clark Davis, of the space just before the audience began filing in, is especially worth clicking to enlarge), an event made more memorable because my wife Alma and daughter Hannah were in attendance. I was there to read from The Moon, Come to Earth, my book of essays on my family’s year living in Lisbon, and beside me sat my friend Jacinto Lucas Pires (the multi-talented novelist, playwright and, as a member of Os Quais, singer/songwriter). 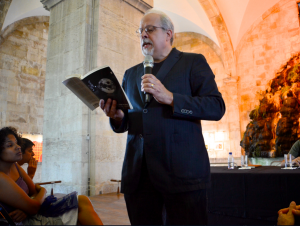 At the beginning of the reading, Jacinto read a section from the Portuguese translation (by Alberto Gomes) of my book, published as Do Lado de Cá do Mar (my Portuguese publisher, Editorial Presença, graciously co-sponsored the event). Mãe d’Agua is indeed beautiful, but with all those vaulted spaces and standing water a certain echo effect took hold when I read, and I had to move closer, among the audience, so I could be better heard. At times it seemed as if a clutch of my internal voices was reading along with me. 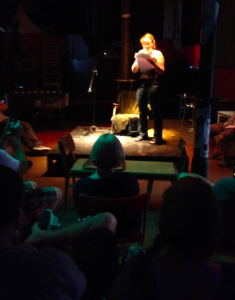 Still, the audience was kind enough not to mind too much (because, really, how many times do you get to sit on a gently swaying, floating stage for a reading? 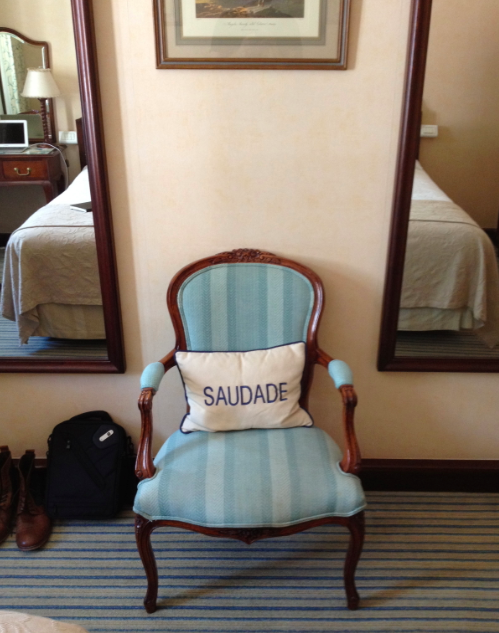 ), and once the wine and canapés started being served, we all worked ourselves up into pre-saudade mode, celebrating a literary conference we won’t soon forget. 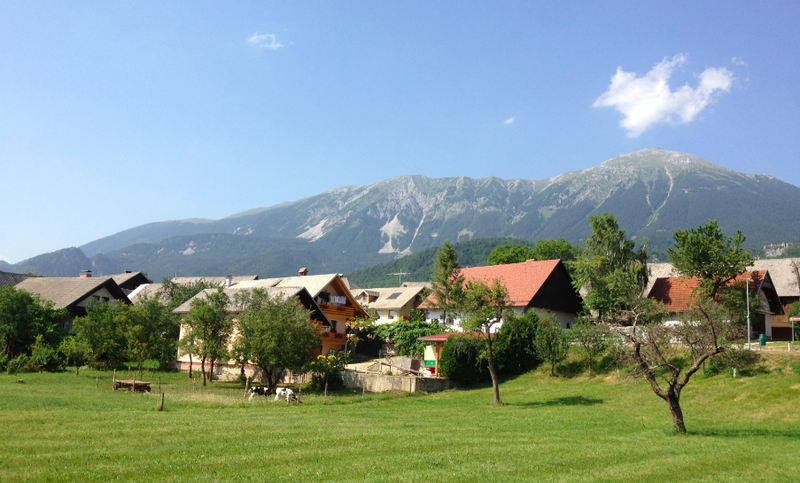 From June 27 to July 6, I served on the faculty for the Vermont College of Fine Arts MFA program’s summer residency in Slovenia, and it proved to be a far more exhilarating experience than I’d imagined it might be. With fellow faculty member poet Natasha Saje, coordinator and writer Lauren Markham and ten Vermont students, though our home base was the medieval town of Skofja Loka, in between workshops and craft lectures we seemed to travel to every literary corner of the country. And Slovenia is a far more literarily rich country than you might expect. Within view of the Slovenian Alps we visited the home of France Preseren, the early nineteenth century father of Slovene poetry, and read from his work in Slovenian (courtesy of writer and loquacious guide Iztok Osojnik) and English translation. We traveled to Tomlin Gorge, to the cave that inspired Dante’s Inferno. 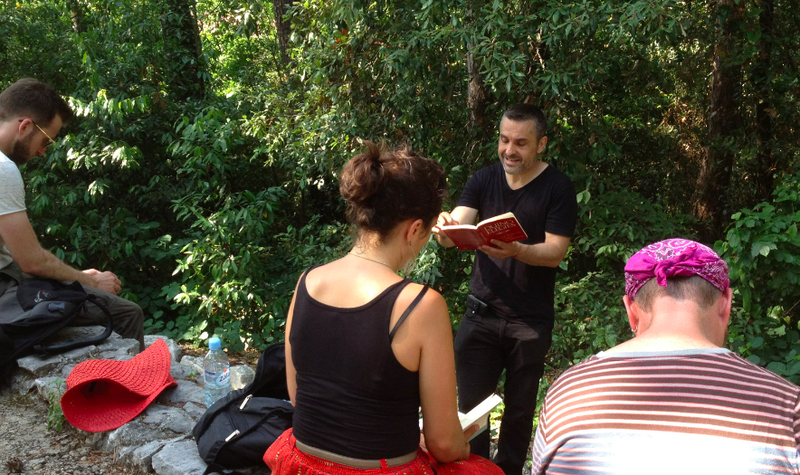 In Ljubljana we were given a private reading by the poet Tomas Salamun, plus a slideshow of the extraordinary art of his wife, Metka Krasovec. 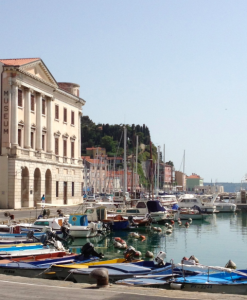 In Piran, on the Adriatic coast, I gave a reading at a seaside café not far from where the photo below was taken. We spent a day in Trieste (now Italian, but formerly the Slovenian city of Trst during the Austria-Hungarian Empire), first to visit La Riciera, the site of a World War II concentration camp and crematorium, and then the James Joyce and Italo Svevo Museum (Joyce wrote much of Dubliners and The Portrait of the Artist as a Young Man during his ten years living there). We continued up the coast to Duino, where Rilke wrote his glorious elegies. While wandering the castle grounds (a landscape from which Rilke drew inspiration) we began an impromptu reading of the Duino Elegies from David Young’s translation that seemed ideal for reading aloud, each of us taking on a poem at a time, and we made it through the first five before we realized the day was waning and it was time to return home. On a second trip to Ljubljana we attended a reading at the alternative Open Café by the writer and gay rights activist Suzana Tratnik, Suzana reading from her wise and humorous work in Slovenian and Natasha following with English translations. 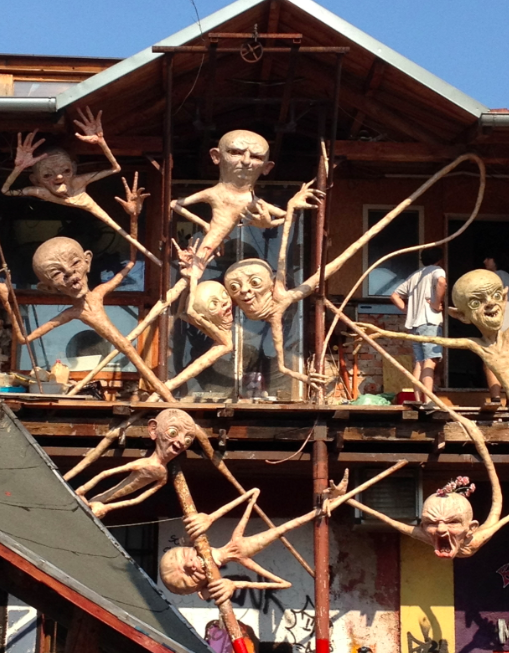 Then we visited the neighborhood of Celica, a former Yugoslavian army barracks and prison that have been turned into a vibrant artists’ colony, where art and sculpture seem to erupt from every building. 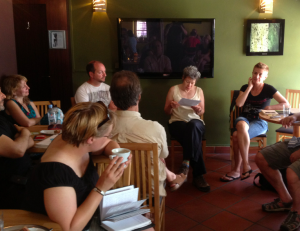 In Celica the Vermont students read together with Slovene poets, a beautiful literary and cultural exchange. Here we see the poet (and surgeon!) Veronika Dintinjanka from that evening reading her work. I’m of course leaving out a great deal from the residency, but you won’t be surprised to hear that by our last day we were all happily exhausted in Skofja Loka as we celebrated student Anu Amran’s quietly moving poetry reading and graduation from the Vermont program. The intensity of the residency had brought faculty and students close together as friends and colleagues. Hvala lepa, everyone! I envy the Vermont College faculty and students who will take part in next year’s program in Slovenia. 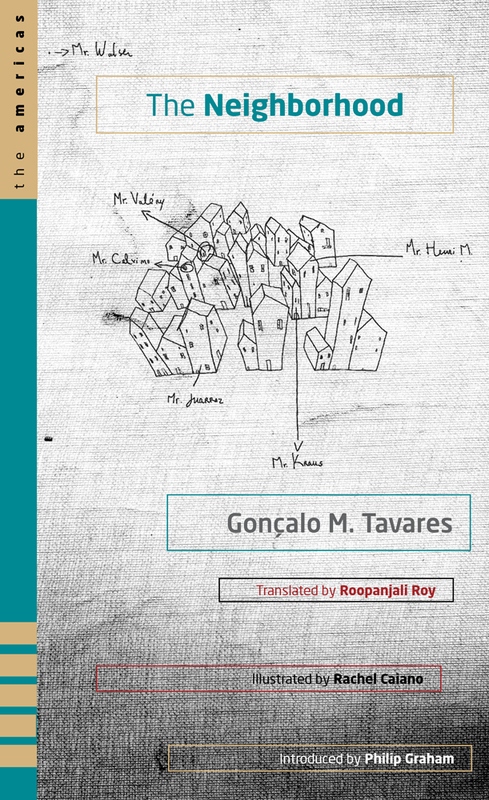 The Neighborhood, by the Portuguese writer Gonçalo M. Tavares, is now available for pre-order on Amazon. Published by Texas Tech University Press as part of their “The Americas” series, curated by Irene Vilar. I was fortunate enough to be asked to write the introduction. Though Tavares is still relatively unknown in the U.S., his work has been translated into dozens of languages, and he is the recipient of Portugal’s José Saramago Prize in 2005, as well as many other international awards. Dalkey Archive Press is releasing Tavares’ The Kingdom series of novels, and now Texas Tech is introducing America to a collection of Tavares’ extremely popular Os Senhores (“The Misters”) series of short books. 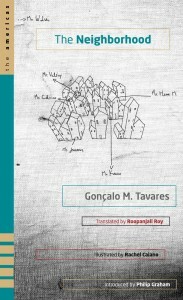 This American edition of The Neighborhood (expertly translated by Roopanjali Roy) is devoted to Os Senhores Calvino, Valéry, Walser, Juarroz, Krauss and Henri. As I mention in my introduction, “all the Misters evoke the identities of important literary figures. To a certain extent the Mister’s personalities work within the perimeters of what we think we know of those writers and, more importantly, of their writing. Mr. Calvino is of course the literary avatar of the Italian fabulist Italo Calvino; Mr. Valéry is a nod to the French poet and critic Paul Valéry” and so forth. It’s a great honor to be associated in some small way with this American edition of such an important part of a major international writer’s oeuvre. I can’t recommend this book more highly. The University of Chicago Press is once again offering as a promotion The Moon, Come to Earth as a free e-book, now for the month of July. Get ’em while they’re hot. The Spring/Summer 2012 issue (Vol. 9, No. 1) of Ninth Letter is out, and once again the artists on the design staff have put together the issue’s fiction, poetry and nonfiction in such a way that calls into question just how a literary magazine should be constructed. And yet the organization is, in its own way, transparent, and so the magazine helps you, gently, make your way through. And there’s damn good reading inside. As the nonfiction editor, I can certainly vouch for the essays included in the new issue. “Dark Angel” by Brenda Miller is a beautifully written, oblique poetic look at the fear of (and secret attraction to) mortality; “As Seen on TV!” by Anna Vodicka chronicles, with heart-breaking humor, a dysfunctional family’s years long fascination with infomercials; “Something Californian” by Timothy L. Marsh, offers a possible peek into the reputed home of Chuck Morris by the author’s feckless seventeen-year old pool cleaning self; and finally, “Picnic Geese” by Patrick Gross, recounts perhaps the strangest tale of hunting for the family dinner table that I’ve ever read. Do Lado de Cá do Mar, the Portuguese edition of my book on Lisbon, The Moon, Come to Earth, has been kindly received so far in Portugal. Reviews have come in from Actual (the arts magazine of the national news weekly Expresso), TimeOut Lisboa, Diário Digital, iOnline, Trend Alert, Baú-dos-Livros, and elsewhere. I’ve had to crack out my Portuguese dictionary on occasion, but mostly it has been a pleasure reading about the Portuguese take on my take on them. My big fantasy, though, is to visit the Livraria Bertrand in Lisbon’s Chiado neighborhood (a beautiful bookstore on the same site since 1773) and sneak a long glance at my book on display at the front table! 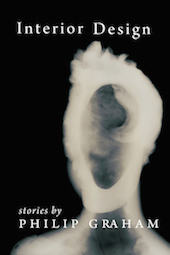 Once a month the University of Chicago offers one of their books as a free e-book, and the deal for the month of March this year is my collection of dispatches from Lisbon, The Moon, Come to Earth. This offer is good until March 31, 2012, so hurry. There has been a healthy spate of books published by some of my former students, and I thought I’d give a proud shout-out to these new authors! 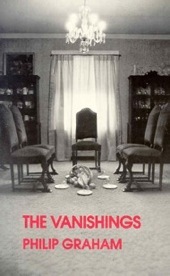 Stephanie Hemphill’s third novel-in-verse, The Wicked Girls, was published in 2010 by HarperCollins and was a finalist for the 2010 Los Angeles Times Book Prize for Young Adult Literature, and John Warner’s first novel, The Funny Man, was published this past fall by SoHo Press/Random House. Both were students of mine at the University of Illinois in the 1990’s . . . time flies, doesn’t it? Meanwhile, Harrison Candelaria Fletcher’s memoir, Descanso For My Father: Fragments of a Life, was published this spring in the University of Nebraska Press’s American Lives Series, edited by Tobias Wolff, and Niya C. Sisk’s short story collection, Bragging Bantering Brawling is just out from Sweet Bee Books. 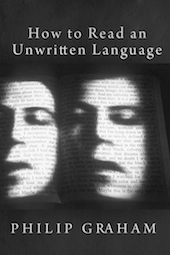 Both authors were my advisees in the early 2000’s at the Vermont College of Fine Arts low-residency MFA program. And if that ain’t enough, two more former students, both from the University of Illinois, have books about to appear this fall: Ted Sander’s story collection (and winner of the Bakeless Fiction Prize) No Animals We Could Name (Graywolf Press) and William Gillespie’s novel Keyhole Factory (Soft Skull Press). I’m very pleased to be one of nine finalists for the 2012 Arts & Literature Prize sponsored by the always excellent 3QuarksDaily website, for my post “What Casablanca Can Teach a Writer.” And what fellow finalists! Gish Jen will choose the three prize winners. A real honor to be considered. You can see the whole list here. And my congratulations to the winners, Melissa Fisher, Leanne Ogasawara, and Syed Haider Shahbaz. I would have voted for them myself. 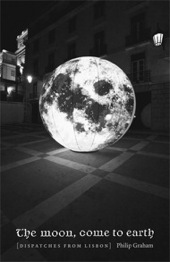 The Portuguese translation of The Moon, Come to Earth has just been published (and on Valentine’s Day!) 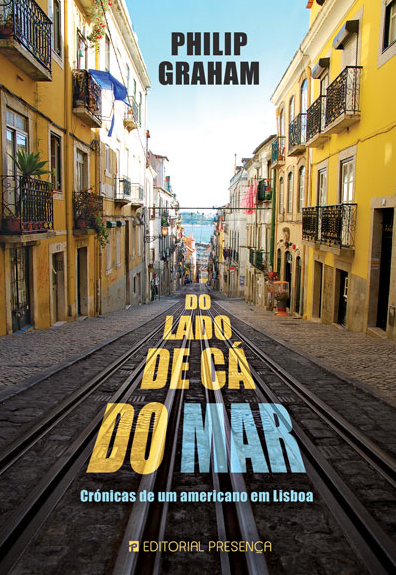 by Editorial Presença, and it comes with a new title, Do Lado de Cá do Mar (roughly, From This Side of the Sea), and a lovely new cover. You can read all about it (in Portuguese) on this Editorial Presença page. My many thanks to the translator, Alberto Gomes, for a job well done. It was a pleasure working with him, and also with editor Manuela Cardoso. And a happy shout-out to the writer Rui Zink, who wrote a wonderful introduction (“Portugal é um Espetáculo!”) for the new edition. The AWP (Associated Writing Programs) 2012 conference, to be held in Chicago, is fast approaching. I’ll be participating in two events, and if you’re so inclined I’d be happy to see you there. On Thursday, March 1, I’ll be taking part in the University Creative Writing Program reading, featuring my colleague Alex Shakar reading a selection from his novel Luminarium, and John Warner, an alum of our undergraduate program and my former student, will read from his recent novel, The Funny Man. 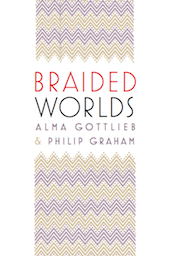 I’ll read from my forthcoming memoir of Africa (co-written with Alma Gottlieb, Braided Worlds. The reading will take place from 4:30 to 5:45 at the Chicago Hilton, Private Dining Room 2, 3rd Floor. You can hear an advance taste of the reading in this podcast, where Alex and I offer brief excerpts of our work. I’ll also be part of a panel, Containing Multitudes: Shifting Voices in Fiction and Creative Nonfiction, featuring Sue William Silverman, Connie May Fowler, Xu Xi and Robert Vivian. 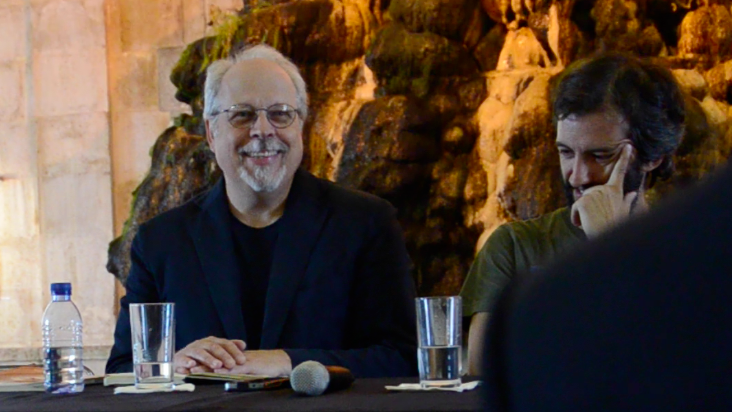 We’ll hold the panel on Friday, March 2, from 4:30 to 5:45, in the Waldorf Room, 3rd Floor of the Chicago Hilton. 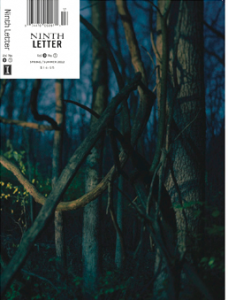 The new Ninth Letter is finally out (vol. 8, #2), and it’s a doozy. It’s perhaps our best-designed issue in quite some time, and that’s saying a lot. 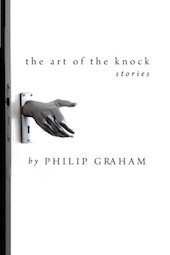 The designers seem to be challenging one’s notion of how a literary magazine is supposed to be organized, and a reader enters into these pages through unusual paths. 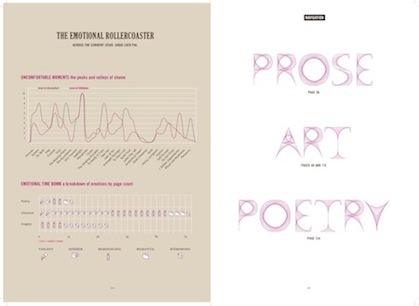 And there are plenty of surprises, including “Distribution of Intelligibility” and “Emotional Rollercoaster” charts. There are also video supplements to complement your reading experience here. I can vouch for the prose and poetry inside, particularly the nonfiction, as this issue marks my first stint as the Ninth Letter nonfiction editor. Michele Morano’s “Crushed” expertly balances the innocent/dangerous sturm und drang complexities of a writing instructor’s attraction to her barely adolescent student; Sue William Silverman’s “Prepositioning John Travolta” is a brave—and darkly funny—investigation of language, desire, and a damaged past; Monica Berlin, in “On Beds, Or Where We Sleep,” examines the rectangular landscape that often escapes our careful attention, the place where we conceive our children, the place “where we learned to be most alone”; in the essay “The Waiting Place,” Jacqueline Saint-Pierre takes the reader to a different landscape, where time resonates with uncomfortable clarity as one awaits the results of a crucial medical test; and finally, Eric Dean Wilson’s “Mephisto: Scenes from the End,” gives us a personal portrait through the lens of Memphis, Tennessee (which lies close to the currently dormant New Madrid fault line), in an essay structured like the different stages of measuring earthquake intensity. Excellent and original essays all! I’m also proud of having had a role in bringing Kyle Minor’s novella, “In a Distant Land,” to the Ninth Letter website. This novella is a series of six letters written by different characters and sent from Haiti during an increasingly chaotic time in that country’s history, six letters that limn the mystery of a young woman whom we never otherwise see directly. We’re offering this intriguing and powerful work as a serial, one letter a week, for the next six weeks, here. Please drop by periodically to take in this unusual publishing event. I was delighted to be nominated for the 2012 Above and Beyond Mentor Award, hosted by the Beyond the Margins website. What an honor, to be on a list of nominees that includes (among many others) the estimable Erika Dreifus. My many thanks to former student Jodi Paloni (explore her website here) for nominating me, and my congratulations to the winner, Johanna Harness. I was recently interviewed by David Inge, on his radio show Focus 580 on the NPR affiliate WILL, about my recent favorite books. These include The Weather Fifteen Years Ago, by Wolf Haas, Music for Silenced Voices, by Wendy Lesser, The Solitude of Prime Numbers, by Paolo Giordano, The Least Cricket of Evening, by Robert Vivian, The Boys of My Youth, by Jo Ann Beard, and others. If interested in a good read, you can listen here. I recently appeared as a guest on WEFT’s Rock Geek Chic, joining hosts William Gillespie and Cristy Scoggins in an exploration of Radiohead b-sides and other obscurities, ranging from the pre-Pablo Honey era right up to and beyond King of Limbs. With over 40 worthy songs to play, we had to do two two-hour shows, so if you’re a Radiohead fan and don’t know these songs, you can kill an entire afternoon here. William and Cristy are quite accomplished “rock scholars,” though for some reason they keep inviting me to their fine show. I’ve done programs on The Byrds, Gene Clark, Procol Harum, John Martyn, and the remarkable Portuguese new-wave band Rádio Macau. If curious, you can listen by clicking on the bold-faced band names above. The Knox Writers’ House Recording Project is now online, and I’m honored to be a part of this grand endeavor: recordings of writers from around the country reading from their own work and the work of other writers who have inspired them. So, I somehow find myself in a stellar group that includes Michael Martone, Carl Phillips, Eula Biss, Kellie Wells, James Tate, Tom Franklin, Brian Evanson, Mary Jo Bang, Peter Orner and many, many others. You can find ’em all here. And you can find the page devoted to me and my work here, where I read from five of my books, as well as the work of James Baldwin and Fernando Pessoa. There’s also a line drawing based on a photo of me flanked by my wife Alma and daughter Hannah. Thank you to whoever darkened my hair to make me look twenty years younger!